From the kitchens of our grandmothers to present-day biscuit-only shops, this sweet and savory food has come a long way in American culture. More than four hundred years ago, explorers of the New World carried a biscuit known as hardtack on their voyages. Hardtack was made from flour, water, and sometimes salt and was sturdy and long lasting, making it suitable for hard, treacherous journeys. The composition and texture of the hardtack biscuit changed at the hands of the Jamestown settlers, who had access to three necessary ingredients that would transform the difficult-to-bite and bland tasting hardtack into a soft, delicious biscuit: soft winter wheat, fat in the form of lard from pigs, and milk or buttermilk from cows. Today’s version of biscuits barely resembles its predecessor. Our preference is for soft, billowy, flaky, and delicious biscuits that can be eaten alone, used as a vehicle for fillings and toppings, or incorporated as an ingredient in a recipe. While biscuits are wildly popular in our culture, they are known to intimidate home cooks. 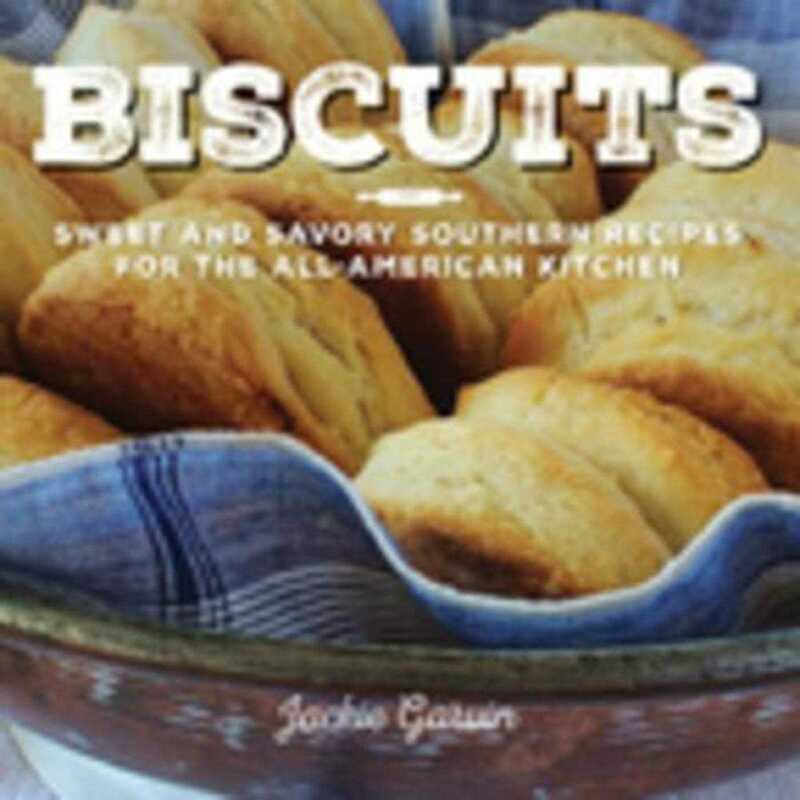 Jackie Garvin overcame her decades long biscuit-making failures by research and trial and error and has emerged to write a cookbook that simplifies and demystifies biscuit baking and highlights the prevalence of biscuits throughout the United States. Rich in Southern history, as well as touching family memories, Biscuits presents a collection of more than seventy recipes including raspberry biscuit pudding with vanilla ice cream sauce, ham biscuits with honey mustard butter, loaded baked potato biscuits, and spicy pimento cheese bites. Also included are recipes for multiple gravies, toppings, and biscuit neighbors” such as peach raspberry scones, chocolate toffee monkey bread, hush puppies, and chicken ’n’ dumplings.